Rex Morgan has been very uneven recently — a potentially exciting Rex ‘n’ Niki adventure constantly interrupted by a single mom ‘n’ rebellious teen story. 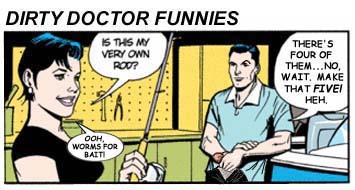 It could only be worse if we were subjected to the occasional “What are Berna and Dex doing with their wads o’ cash” tale, but then, that’s what’s been going on in Judge Parker. 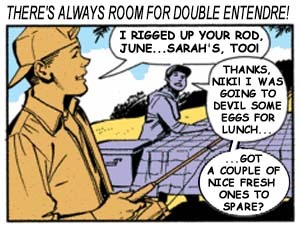 And where there’s Rex and fishing, can Niki be far behind (heh)? This entry was posted on Monday, October 10th, 2011 at 9:33 AM	and is filed under Trust Me, I'm a Doctor. You can follow any responses to this entry through the RSS 2.0 feed. Both comments and pings are currently closed.